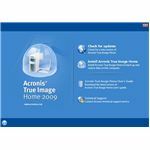 Acronis True Image 2009 Home - Excellent Software That Works! Need an easy to use, reliable and fast backup? 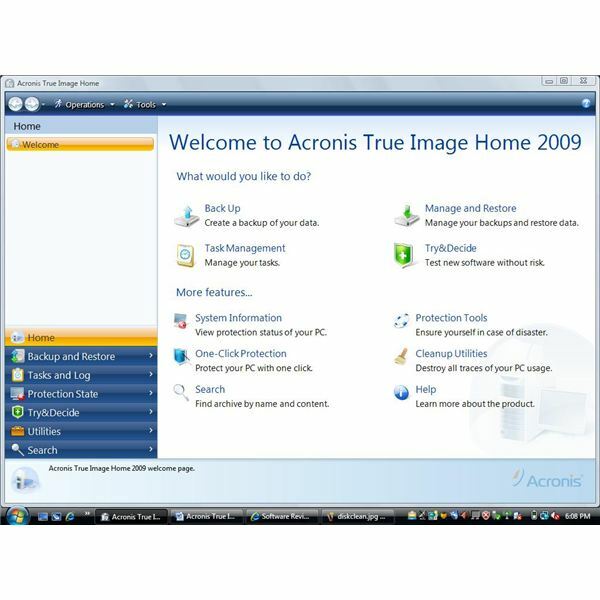 Acronis True Image Home 2009 comes to home users filled with dozens of features. 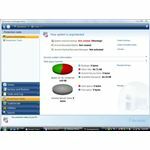 This review examines Acronis’ latest release (no. 12) following True Image 11. 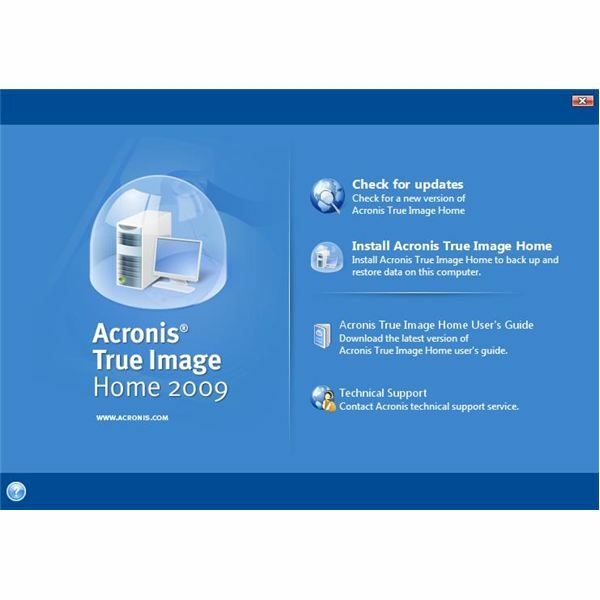 Installation of Acronis True Image was effortless and flawless. 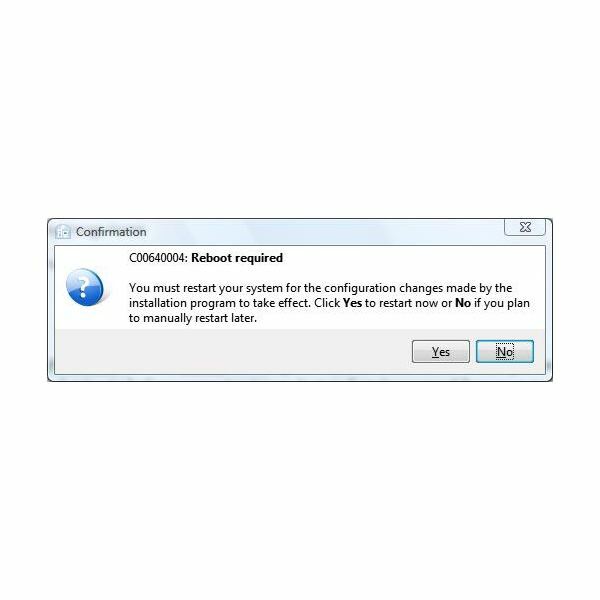 The initial Basic setup required just a few clicks and installation required a reboot to activate Acronis drivers and an initial drive discovery process. The 80 mb setup file was installed within five minutes without asking a slew of questions normally required by other backup software. 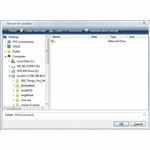 What appears to be a overwhelming amount of choices from other software vendors is an initial menu in ATI that is a strategically designed as a user friendly menu. The Home menu places four items that are the soul of the software under a title of ‘What would you like to do?’ making it very user friendly. These four items; Back Up, Manage and Restore, Task Management and Try&Decide are self explanatory. Great thought was put in to this menu design to prevent users from initiating clicks and ‘hunting’ for the appropriate feature. Acronis is right on the money when it comes to navigation and features. The Back Up feature allows for the backup of an image of the entire disk or a partition on the physical drive. This feature gives an easy step by step consolidation of the method of backup. It allows you to select the Source and Target, to setup scheduling, the backup method (Full, Incremental or Differential – with excellent descriptions of each! ), files to exclude (to prevent wasted space of temporary files), more than 10 backup options that include encryption, and automatic consolidation. This wizard makes backups easy for the home user and it includes encryption (AES 256) with password protection! The My Data feature allows for the above features while allowing the home user to select specific files or folders. The System State feature allows for the system state to be backed up. This critical backup allows for the system state to be backed up fully the first run and incrementally for each subsequent run. Often home users are left out in the cold when backing up email (Email Backup). Acronis thoughtfully placed an easy to understand wizard for email backup under the backup menu. This step by step wizard backs up all email including contacts. This feature is a must have for any home user. Typically backup programs overlook application (Application Features) settings on major applications such as Microsoft Office. Acronis’ research team did their homework with this important feature. Again a wizard is provided for a step by step walk through on these invaluable settings. The user interface provides an easy methodology to return to the ‘Home’ screen allowing users to easily find their way around such complex software. Software that is easy to maneuver usually lacks the core components need to be truly great software. The Tasks and Logs feature shows a full calendar so users can see when tasks are scheduled allowing the user to modify these tasks accordingly. The Try&Decide feature allows for the ‘experimenting’ of adding software without damage to system files. 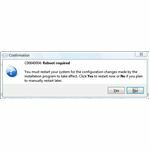 This feature is a feature every home user needs to ‘try’ software before installing it. This feature could be a program in itself. The Utilities menu gives home users a step by step wizard to add extra hard drives or to clone them. This feature is needed with home users upgrading or changing storage frequently. This ‘extra’ is an awesome feature on an excellent product. The startup bootable media creation allows for the creation of an .iso image in case of catastrophic emergencies that require a boot disk. This feature is another well thought through process that allows home users an alternate selection during a crisis. Initial test of Acronis began with a system state backup. This backup took several minutes across my home network to a mapped drive on a Windows Vista machine acting as a server. The backup was fast, efficient and unseen (I elected to hide the backup status while continuing to work). The CPU utilization was average and the backup was unnoticed. Often backup software uses a majority of system resources impacting the use of the computer until the task is finished. One word. Excellent. Using each of the features in Acronis, including the copying of files to a test folder, backing them up with Acronis and deleting the source only to restore them later went flawlessly. The restore process was fast and easy with the easy to use interface made for home users. Use popular search options such as Google Desktop – this feature allows you to find files fast. Archive to the popular zip format – allows you to save space by compressing your backup. Encryption of archive data. Protects your sensitive data with AES 256. With data theft and loss on the rise, this insurance helps you maintain a peace of mind. Make reserve copies of your backups – This option allows for you to put copies anywhere you want. With the encryption and password protection, you don’t have the worries of unencrypted backups. Consolidate backup files – allows for you to delete backups without fear. Automatic consolidation – sets limits and number of backups to keep you from pulling your hair out on what to keep and what to get rid of. 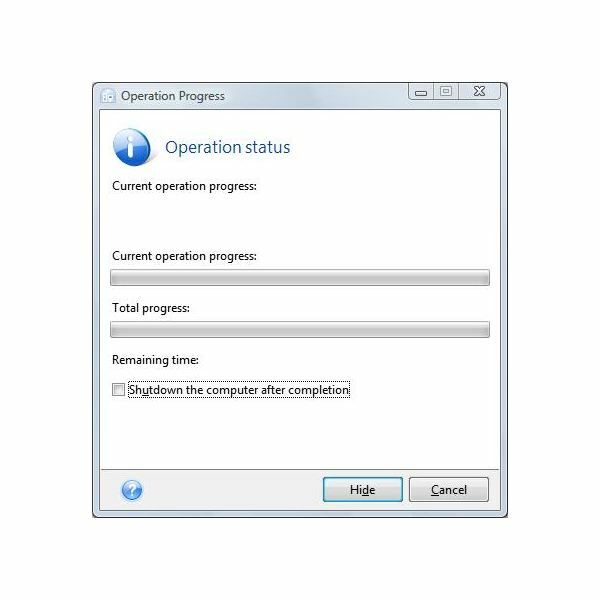 Automatic computer shutdown after backup or restoration finishes – shuts down your computer after you backup your data. This allows you to start and leave without worry. Try & Decide enhanced – creates a ‘virtual area’ on your hard drive to test software. Stays intact during restarts or shutdowns. More archive location options – Allows you to use network, usb, FTP and other options. 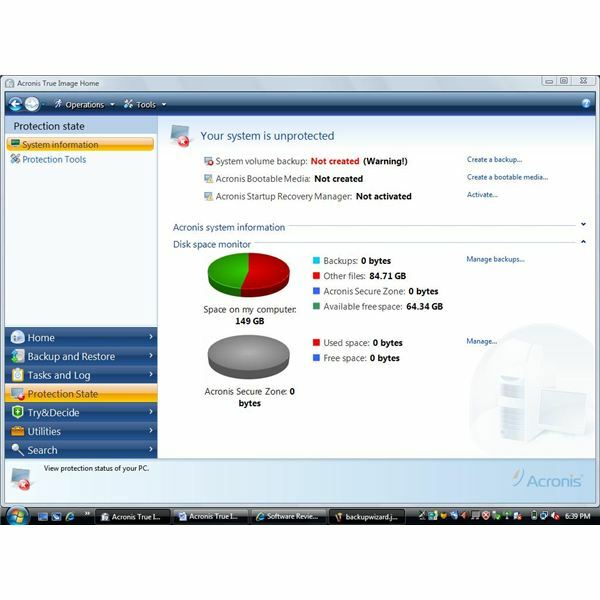 Automatic backup to a removable drive – when a select drive is plugged in (the same for each session), Acronis takes over and backs up instantly. New User Interface – Easier to use and made truly for home users. Impossible to get lost in. Navigation is easier and well thought out. 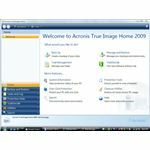 Acronis True Image Home 2009 is truly the de facto of backup software. Loaded with features that are easy to use, fast and efficient, this software provides the home user with data asset protection that is well worth the money.